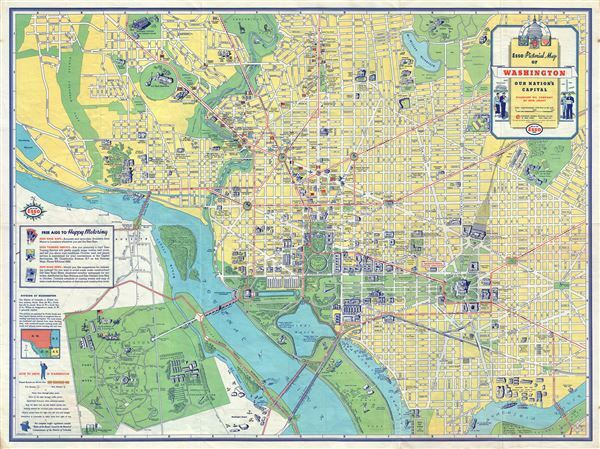 1930s General Drafting Company Map or Plan of Washington D.C.
Esso Pictorial Map of Washington Our Nation's Capital. This is a beautiful 1930s map or plan of Washington D.C. by the General Drafting Company. It covers the nation's capital from Arlington Cemetery and the Washington National Airport north to Soldiers' home (Armed Forces Retirement Home) and the Zoological Park (Smithsonian National Zoological Park) and from the Grover Archbold Park and Foxhall Crescent east as far as Lincoln Park. The map is wonderfully detailed and notes individual streets, parks, lakes, bridges, rivers, reservoirs, railroads, postal routes and other important topographical features with beautifully illustrated parks. Individual monuments, buildings, museums, statues, government buildings and attractions are rendered pictorially. Several attractions are accompanied by illustrations and short descriptions, such as 'Superb exhibition of riding and mounted drill' and the illustration of the Tomb of the Unknown Soldier in Arlington Cemetery, horse back riding, airplanes and aircraft hangars in the airport, people golfing, picnicking, animals in the zoo, 'The White Lot' referring to the White House lawn is describes as 'Where Washington children roll eggs on Easter Monday,' 'Zero Milestone, all mileages measured from here,' 'Washington Navy Yard, Established 1800, Ancient Cannon and model-testing basin,' and countless other monuments and popular attractions. The lower left quadrant includes an inset featuring the division of Washington along with an explanation. Text on 'How to drive in Washington' is also included. A small advertisement near the left border promotes other road maps, news and services provided by Esso. Verso contains an Index to principal points of interest in Washington and vicinity, including parks, embassies, museums, flying fields, national organizations, government buildings and institutions, statues and monuments, etc. A large pictorial road map of Washington D.C. and vicinity featuring illustrations is also included on verso, along with an inset of the historic landmarks of Alexandria. This map was copyrighted by the General Drafting Company, New York and Issued by the Standard Oil Company of New jersey. Very good. Minor wear along original fold lines. Verso contains road map of Washington D.C. and vicinity.